The guitar from your nightmares—come to life. 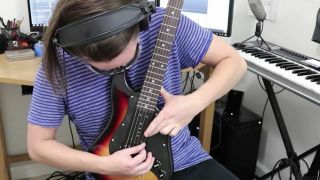 Experiment: Does Down-Tuning Make Your Guitar Sound Heavier? Internet gent and multi-instrumentalist Rob Scallon recently posted a video called "The Down-Tuning Experiment." Yourwife's cousin talks you into going on a hike with "the whole gang." Then your wife says, "Why not bring your guitar for when we're sitting around the campfire?" What we have here is a video showingPete O'Connell—inventor of something called theRhysonic Wheel—playing a cover of Michael Jackson's "Don't Stop 'Til you Get Enough." Hey, there are no guitars in this video! That's nice. Anyway, check out "100 Bass Riffs: A Brief History of Groove on Bass and Drums," a 2014 video by the crew at Chicago Music Exchange. What if the best dead and living metal guitarists came together for one final jam? So asks Music Is Win, a Facebook-based lesson site in its recently posted video, "Eight Metal Legends, One Track."